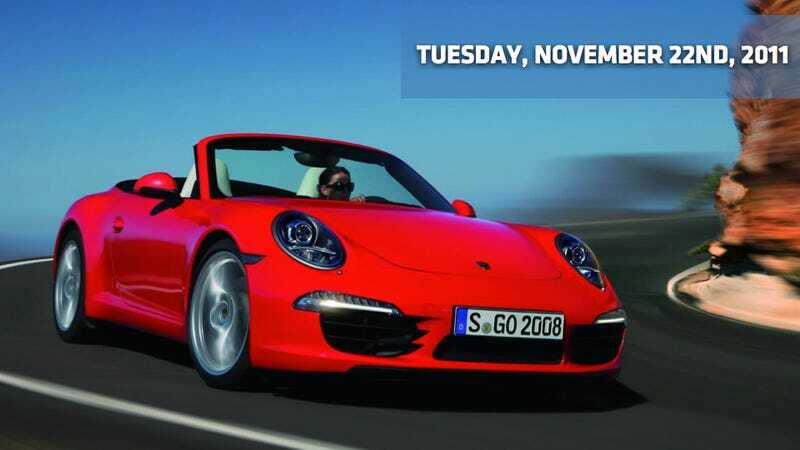 The very first details and photos of the 2012 Porsche 911 (991) Carrera Cabriolet and the Carrera S Cabriolet have been liberated from the Deutschland. The details are that the drop-top version gets the same engines as the Coupe. The Carrera Cabriolet's 3.4-liter engine packs 345 hp while the Carrera S cabriolet gets a little extra from the 3.8-liter engine with 394 hp. The roof design in the up position retains the 911 roof line of the Carrera Coupe, complete with a fabric soft top just like its predecessor. Additionally, Porsche has introduced a new lightweight folding roof frame using magnesium. Lightness, FTW! Both versions hit the German market in March of next year. No word yet on when we get it over here. We're just a week away from the unveiling of the Toyota FT-86 / Scion FR-S at the Tokyo Motor Show and Toyota's just dropped a one minute commercial on the new super-Supra. It's called "Devoted to Innovation" and... well... I really like it. So sue me! 3rd Gear: M550d Will Make 381 HP, 516 Lb-Ft of Torque, Glorious Torque! The rumor 5post has coming out of a BMW dealer presentation held in the Netherlands last week is that the previously rumored M550d will officially make 381 HP from its tri-turbo inline-6 cylinder diesel motor, far lower than the initial speculations of 500+ HP. But it will make over 516 lb-ft torque! Finally, according to 5post, it will be AWD-only, as speculated earlier. Production of the M550d will begin next March, but it's not yet known whether this model will be available in North America. Future applications for this new tri-turbo diesel motor will include at least the X5 and X6. The 2013 Chevrolet Malibu Eco midsize pricing will start at $25,995 — including a $760 destination charge but excluding tax, title, license and dealer fees — when it arrives in dealerships in the first quarter of next year. Although the 2013 Malibu Eco uses General Motors' eAssist battery electric/gas propulsion system, (three-week-fire-starting lithium-ion battery and an electric motor-generator to enable regenerative braking, electric assist and start-stop functionality) to deliver a GM-estimated 26 mpg in city driving and 38 mpg on the highway — making it Chevrolet's most fuel-efficient Malibu ever — it's still getting waxed by the opposition. The Camry and Sonata hybrids both have higher combined fuel economy — and the Ford Fusion's got about the same — and none are that much higher priced. The Detroit News is reporting that the United Auto Workers is shifting its focus to organizing foreign automakers now that contracts are secured with Detroit's Big Three. UAW President Bob King claims his agenda includes organizing Asian and European automakers with plants in the United States. He used an event on Monday celebrating the reopening of General Motors Co.'s Spring Hill, Tenn., plant, to tout the merits of collective bargaining in adding jobs. The UAW has yet to pick a target although they are "picketing" some "key" dealerships. Yeah, I don't think this is gonna work. What is this — Hollywood organizing? 6th Gear: Harley-Davidson Is The New Ford? Bloomberg tells us this morning that Keith Wandell is trying to do at Harley-Davidson what Alan Mulally did at Ford. So how are they alike? Well, both were brought in as chief executive officer from outside the company — and they were even brought in from a different industry! Will the similarities ever cease? Nope. Also, neither owned a vehicle made by the company he took over. When they got their new jobs, they cut fixed costs in labor contracts so the company could respond better to downturns. They also shed brands that detracted from the one that shares the company's name. Wandell, as even one of the first auto-supplier executives Mulally met after joining Ford, and Wandell said his automotive counterpart provided him with a useful template for his own corporate turnaround. Well, if Mulally said it... it must be right, right?